Acure Organics is a family owned and operated company founded on sustainable principles to provide the highest quality fair trade, natural and certified organic personal care products. Our products are created with great care and are a reflection of our values. Each of our products is free from animal testing, parabens, sulfates, phthalates, synthetic fragrances, harmful preservatives and artificial colors. We travel the globe to find the most potent certified organic ingredients that meet our high standards of efficacy and purity. We thank you for sharing in our mission to have a positive impact on the world we live in. Provides lasting moisture to even the most dry and damaged hair leaving it soft, manageable and ready to rock. Organic Argan Oil + Argan Stem Cells, CoQ10, and Organic Sea Buckthorn Oil--high in Omega 7, make up our patent-pending Triple Moisture System. Pumpkin Seed Oil --high in Omega 3 and 6 fatty acids, adds shine. Hair repair with serious flair. Safe for color treated hair. Build dynamic volume with intense lightweight moisture! For hair that feels thicker, fuller, and uplifted. Quinoa protein extract supports keratin. Argan Oil + Babassu Oil provide lightweight moisture for root and scalp maintenance. Echinacea Stem Cells promote cellular regeneration at the root level. Forget the neighbors…turn up the volume! Rough day? Late night got you feeling like a zombie? Break out of that funk with this uplifting lotion that restores brightness and rejuvenatues your spirits. Non-greasy formula so that much needed coffee won’t go flying out of your hand! Vitamin C you later stress! Advanced Triple Moisture System of Organic Argan Oil, Organic Cocoa Butter, and Organic Olive Oil provide serious hydration. This extra-gentle, creamy facial cleanser features the moisturizing benefits of Fair Trade Certied™ Organic Olive Oil, Moroccan Argan Oil, and Cocoa Butter, the antioxidant power of Blackberry and Rosehips and the mild cleansing of mint. It quickly removes makeup, dirt and impurities without stripping the skin’s natural acid mantle. Great for even the most sensitive skin. This easily absorbed facial moisturizer improves texture and tone, minimizes fine lines, and helps prevent breakouts. Lilac Stem Cells are shown to balance oil and heal blemishes, while Chlorella Growth Factor helps rejuvenate damaged skin cells. Control sebum production while boosting overall balance in the skin with this ultra-light moisturizer. Nature’s nocturnal miracle! Age-fighting Argan Stem Cells, shown to help the skin’s natural repair process, firm and moisturize while 2% Chlorella Growth Factor fortifies collagen and elastin fibers. Hydrating Moroccan Argan Oil seals the deal, truly making this nature’s own skin rejuvenating system. Let this yummy little number take you away to a tropical paradise. Except you don’t have to get on a plane, have your bag get lost, get yelled at by a taxi driver, cut your foot on a stupid seashell, and get hungover on umbrella drinks. All you have to do is suds up and rinse. Much, much easier. Certified organic and stress free, it soothes, protects and provides moisture that a typical castile can deplete. Minty freshness in a moisturizing Argan castile that will put some tingle in your dingle. Our Argan Oil castile soap is certified organic under the USDA National Organic Program, using only the best certified organic oils to soothe, protect and provide moisture that a typical castile soap can deplete. I had the pleasure of trying all of these wonderful products by Acure and I have to say I loved everyone of them! The Triple Moisture Repairing Shampoo and conditioner made my hair look and feel moisturized. My hair felt silky soft and it helped to repair my dry brittle hair within a few days. The pure mint + echinacea stem cell shampoo and conditioner gave my hair lots of volume, which is a tough job to do because I have very fine hair. They also smelled wonderful! I loved Acure's energizing body lotion! It smelled so invigorating and refreshing and left my skin hydrated and soft. 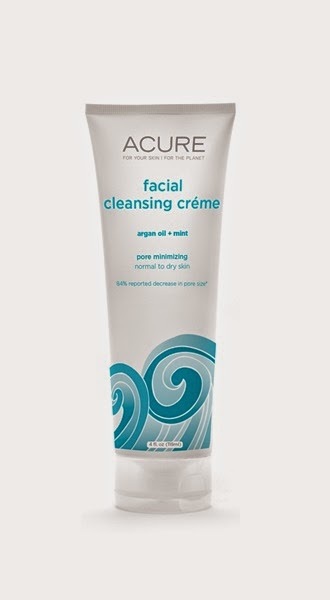 The facial cleanser gel by Acure washed off every trace of makeup and left my skin feeling hydrated and clean. I also liked the facial cleansing crème. It smelled wonderful and cleaned my skin without drying it out. 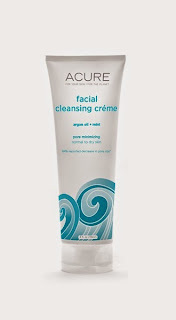 Acure's sensitive facial cleanser worked great as well and left my skin feeling clean and refreshed. 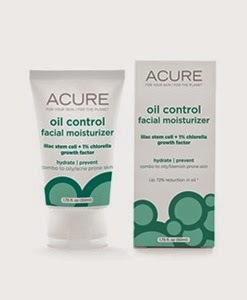 Acure's oil control facial moisturizer: lilac stem cells + 1% chlorella growth factor left my skin looking moisturized and hydrated while also helping to reduce my breakouts within a few days. The night cream helped my skin stay hydrated all night and by morning my skin look hydrated and refreshed. I also enjoyed the Argan Oil Castile Liquid Soap, Tropical Citrus and Argan Oil Castile Liquid Soap, Peppermint. They smell amazing and cleansed my skin without stripping my skins natural oils. My skin was left moisturized and clean. These products are all amazing and I love that Acure's products are all organic and free from animal testing, parabens, sulfates, phthalates, synthetic fragrances, harmful preservatives and artificial colors. Click HERE to find a store near you to purchase. Follow Acure Organics on social media!